In the interest of preserving and celebrating our illustrious history of over 150 years, The Fourth Crown presents the third of a 2,928,608 part series, FLASHBACK, chronicling the most important events in Gustavus Adolphus College’s history. Our third installment looks back to the inception of Gustavus Adolphus College’s annual Case Day, renowned as a day devoted to gluttony and mass consumption of Lucifer’s Mouthwash: Beer. While Case Day might be an institution on campus today, this has not always been the “case.” The event was contested from the launch. Time changes, and so does the dominating attitude towards controversy. The tradition coincided with the origins of Gustavus’ first Pre-Law Club in the fall of 1879. Senior Erland Swensson and a group of twenty-three other students founded the organization. While much of the organization’s first activities involved the study of agrarian litigation, the high spirits of this organization fell, and they fell quickly. Employment for attorneys in the early 1880s was one of the worst markets the nation had ever seen. The confidence of Swensson and the members of his organization plummeted, leading to the group nearly disappearing from the campus early in the spring semester. But Swensson, like any healthy student dealing with the sting of disappointment, picked up a case of the newest American beer, Budweiser, and pledged to drink all of them as a symbolic act. The metaphor, as Swensson explained, was based on drinking the number of beers equal to the number of students with empty dreams in their organization—24—and a full case because this was the only case they would ever be able start and finish. In the following years, Case Day spread from the Pre-Law Club (who later became the Greek organization now known as the Reds) to more of the campus. For the next several years, participation increased by anywhere from 10 to 20 more individuals per year. Case Day was gaining steam. An example of an anti-Case Day propaganda from 1883. However, this growth met backlash. 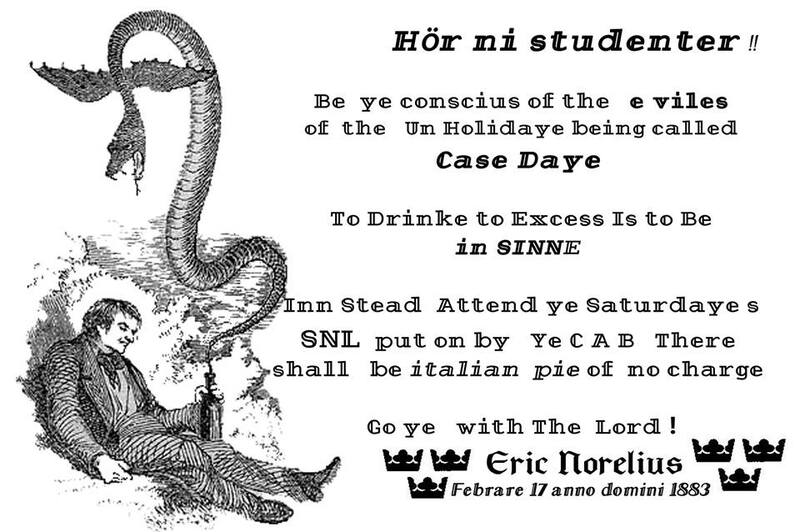 In 1883, founder of Gustavus Adolphus College Eric Norelius caught wind of these activities, and started a task force to prevent the binge drinking culture that was intensifying on campus. This group, known as the Campus Activities Board, was Norelius’ own Special Forces unit tasked with making anti-Case Day propaganda and kidnapping those suspected of participating. Coupled with the infringement on First Amendment rights CAB propagated and their inability to curb this trend, Norelius disbanded the Special Forces unit two years later, and the Campus Activities Board became a less violent, more democratic group. From that point on, Case Day has developed into what we know it is today. Not without its detractors, Case Day has grown from its meager, depressing origins, to a slightly less depressing day celebrating the gluttony of the contemporary college student.